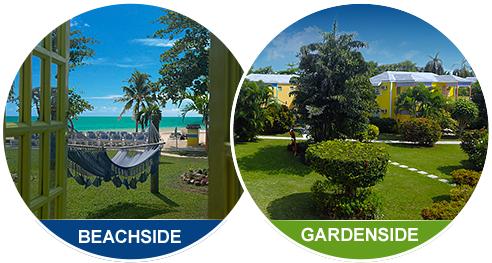 Our garden-side rooms are located on the land side of Norman Manley Boulevard, while beachside rooms are located on the beach side of the boulevard. All of our Negril accommodations include air conditioning, coffee/tea maker, iron/ironing board, in-room safe, cable TV, clock radio, hair dryer, private bathroom with tub and shower, direct dial telephone, ceiling fan (some 2nd floor rooms) and balconies/patios (cottage rooms). Our beachside accommodations are located on one of the planet's most celebrated stretches of sand - Negril's Seven Mile Beach! Eat to your heart's content, sip a cold one and shop for bargains, all within feet of the sparkling sea.